* Lovely silicone molds to create beautiful dimensional pieces to embellish your décor and art projects. Use over and over again! * They play well with so many types of media! 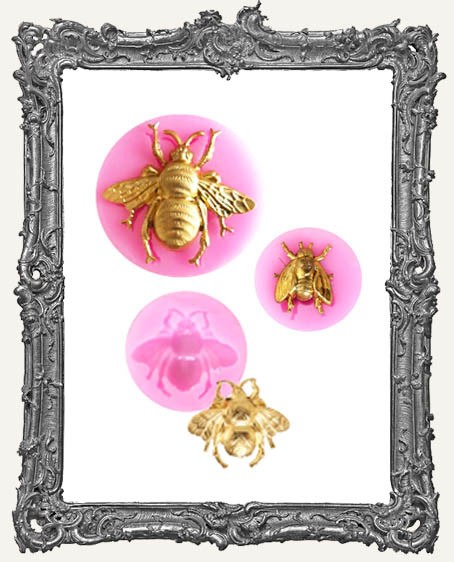 * Includes the three different bee molds as shown. The bees measure approximately .5" x .75", 1" x 1.25", and 1.5" x 1.5". * Because of the fine details on these pieces, a quick cure resin or regular resin is recommended for best results. I used the quick cure resin for my samples. * Listing is for the molds only, not the castings shown as a sample. * Find our entire selection of Molds HERE.